Reaching a balance between art and design, Dror Bershetrit deals with product design, architecture and art direction mixing the techniques learnt at the Design Academy of Eindhoven and the taste for arts that... Read more derives from his studies at the Center for Art Education of Tel Aviv. Today Studio Dror collaborates with great Brands such as Boffi, Levi’s, Surface Magazine, Swarovski and Rosenthal; with this Brand he won the iF Product Design Award in 2006. Dror is responsible for intriguing designs as the Peacock Chair and the Tron Armchair for Cappellini. 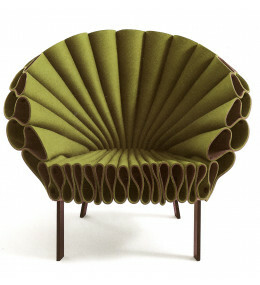 Peacock Armchair constructed of crumpled sheets of felt. A robust yet comfortable easy chair.